We are having a SALE on select American Craft designed ribbon... they come in spools of 4 feet for $1.00 - and they are absolutely darling. 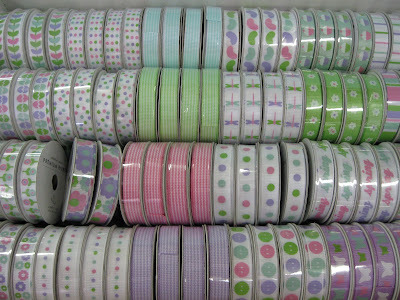 Perfect for wrapping, adding just a little piece to a bigger bow, scrapbooking, home-made cards, AND for hair accessories! All spring and summer styles are now BUY 2 GET 1 FREE! While supplies last. Today is the BIG Homecoming Football Game at Lehi High School... we just want to wish them GOOD LUCK!! Come in today for a 20% discount on ANY PURPLE ITEMS! Balloons, face paint, hair spray, leis... great to wear to the game tonight!